Capital punishment for two, a suspended death penalty for one, life imprisonment for three, 15-year jail terms for two and varying sentences for the 13 other accused. 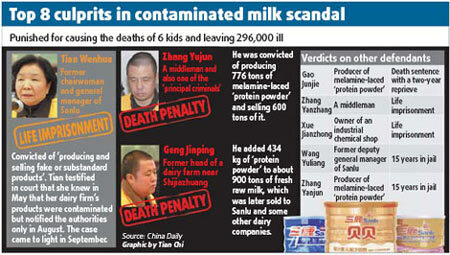 Those were the verdicts passed by five courts Thursday in the melamine contaminated milk case in which Sanlu Group executives, suppliers to the dairy firm and middlemen were the accused. The Intermediate People's Court of Shijiazhuang sentenced Tian Wenhua, former chairwoman of Sanlu Group, to life imprisonment. Tian, 66, was convicted for her failure to stop producing and selling milk products even after she was informed that they were contaminated. She was fined about 25 million yuan ($3.7 million), too. The court in the capital of Hebei province handed death penalty to Zhang Yujun, a middleman, and Geng Jinping, former head of a local dairy firm, too. Prosecutors said Zhang was one of the "principal criminals". He was found guilty of producing 776 tons of melamine-laced "protein powder" and selling 600 tons of the produce to middlemen for 6.83 million yuan ($998,000). "The methods adopted by Zhang Yujun (to make the powder) are extremely dangerous and the outcome of his crime is grave," one of the three judges said. Geng was found guilty of adding 434 kg of melamine-laced powder to about 900 tons of fresh milk to artificially increase the protein content during quality tests. He sold the milk to Sanlu and some other dairy companies. Gao Junjie, who supplied the melamine-laced "protein powder", was handed down the death penalty, suspended for two years. Such a sentence usually gets commuted to life imprisonment. The court found Gao guilty of making more than 70 tons of the "protein powder" with the help of his wife Xiao Yu, who got five years. Life sentences were handed down to Zhang Yanzhang, a middleman, and Xue Jianzhong, owner of an industrial chemical shop. Wang Yuliang, a former executive of Sanlu, once the country's leading baby milk food producer, and Zhang Yanjun, another melamine-laced powder maker, were given 15 years. 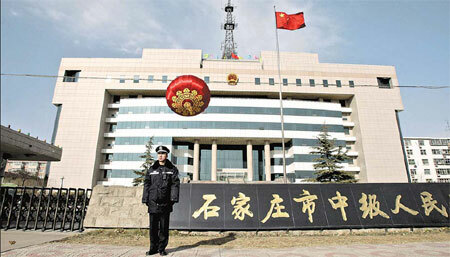 Two other former executives of Sanlu, Hang Zhiqi and Wu Jusheng, got eight and five years in jail. Sanlu, awaiting acquisition after declaring bankruptcy last month, was fined more than 49 million yuan ($7.2 million) for making and selling substandard products. The courts handed down sentences ranging from two to less than 15 years to the other accused. They were convicted for their involvement in making or selling the contaminated products that claimed the lives of at least six babies and left 296,000 others with various urinary tract ailments, including kidney stones. 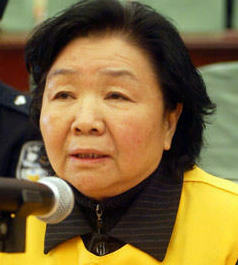 Tian appeared calm during her 25-minute hearing in court, and her lawyer Liu Xinwei was not surprised with the sentence. "So far we haven't decided whether to appeal," Liu said. Several media organizations were allowed inside the Shijiazhuang court during the trial, though many parents of children who fell ill were denied entry. Police set up barricades and banned vehicles and unaccredited people from entering the lane in front of the court from the morning. Some parents said they were satisfied with the verdicts. "They deserve the sentences," said Dong Shiliang, father of a 13-month-old victim in Yunnan province. But some others asked why the trial was closed to the victims' families. "We just want to see justice prevail," said Zhao Lianhai, father of a victim, who has been leading a parents' petition group.